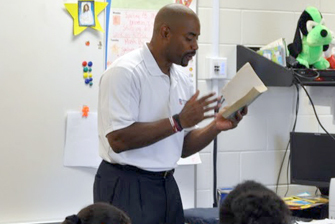 In celebration of the 2011 Children's Book Week, May 2-8, 2011, Author and Community Activist, Chris Draft read to the eager and attentive students at Norcross Elementary in suburban Atlanta. Since 1919, Children's Book Week has been celebrated nationwide with noted author and illustrator appearances, storytelling and other book-related events in schools, libraries, and bookstores around the nation. As an advocate for literacy empowerment, Chris was inspired to write his first book, Do you want to play catch?. In this timeless children's book, Chris shares his story of how the simple game of "catch" can teach valuable, lifelong lessons in both building relationships and sharing family time. This heartwarming story of playing "catch" will encourage readers to find a way to strengthen their family bond and promote healthy, physical activity. Chris has been honored by various organizations, including the NFL and partnering with the White House Department of Education's Let's Read Campaign for his tireless contributions around literacy. It is Chris's hope that his first book will be used as a way to inspire children and their family to spend quality time together while living healthier and more active lives. The Chris Draft Family Foundation focuses on seven primary initiatives with overarching themes that stress the importance of education, healthy lifestyles, character development, personal responsibility, self-discipline and physical fitness. The Foundation seeks partnerships with local and national community health organizations, school districts and non-profits across the country, striving to empower and uplift communities by educating and equipping families to make healthier choices.